Kawanoe castle (川之江城) is located at a small hill named Washioyama mountain aside Kawanoe port, at the center of north shore of Shikoku island and eastern edge of Ehime prefecture. Kawanoe castle is also called as Butsuden castle (仏殿城), and Butsuden is the word of Buddhist hall. The name of the Butsuden castle stem from the fact that formerly there was a Buddhist hall on the hill before the castle. Kawanoe area was an important place of connecting four provinces of Shikoku island, thus Kawanoe castle had been a target for struggle by surrounding warlords. 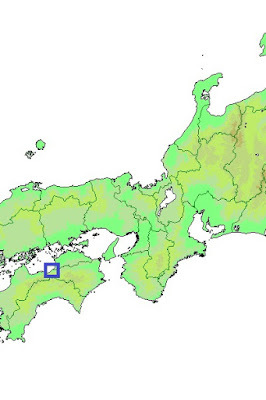 Kawanoe area has been the center of communication of Shikoku island. 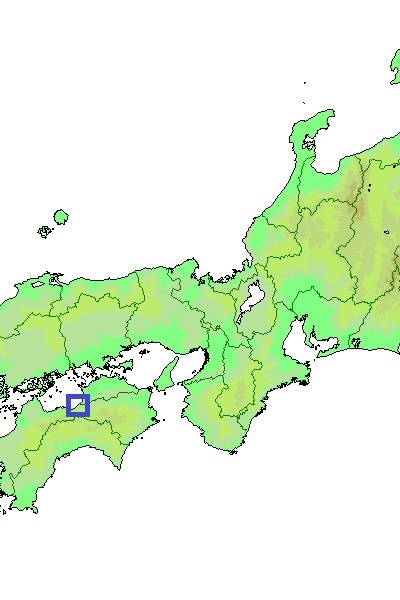 Most part of Shikoku island consist of mountainous area not suitable for dwelling, and large flat land is limited to Takamatsu and Marugame area at northeastern seashore, Yoshinogawa valley continues toward east coast, Dogo plain at the northwestern seashore, and Kochi area at southern coast. Above areas are applicable to the center of current Kagawa prefecture, Tokushima prefecture, Ehime prefecture and Kochi prefecture. Kawanoe area locates at the middle of coast way connecting Takamatsu area and Matsuyama area, and only 30 kilometer apart from western edge of Yoshinogawa valley. Main road to Kochi area across the central mountainous area is built along with Yoshinogawa river toward southward, thus Kawanoe area is also connected to Kochi area. From Kawanoe area four big cities of Shikoku island (Takamatsu, Tokushima, Matsuyama and Kochi) are all located within 100 kilometer, and even now highways to each cities are connected at this area. Due to this geographical location, Kawanoe castle had been a target of struggle for long time. Originally Kawanoe castle was built by Kono clan, the governor of Iyo country (Ehime prefecture) in 1337, to protect their territory against attack from Sanuki province (Takamatsu prefecture) or Awa province (Tokushima prefecture). Washioyama mountain is not a large one but surrounded by sea and rivers it was a good place to build a castle. As expected, Hosokawa clan, a large lord held Sanuki country attacked Kawanoe castle third time and occupied in 14th century, but left soon and the castle was returned to Kono clan. For a while this castle had been in peace, but was involved in disturbances again in the latter half of 16th century. At first Miyoshi clan of Awa province attacked this castle in 1572 and this castle rejected this attack. But as Tomoharu Metori, commander of the castle attempted to change to Motochika Chosokabe (1539-1599), a rapidly growing warlord of Tosa province (Kochi prefecture) in 1582, thus Kono clan killed Tohomaru and placed his general Yasukatsu Kawakami. But two years later, Motochika attacked Kawanoe castle, and Yasukatsu shared his fate with the castle. In 1585, Kawanoe castle was besieged and occupied by Takakage Kobayakawa(1533-1597), a vassal of Mouri clan during Shikoku campaign of central ruler Hideyoshi Toyotomi (1537-1598). As an important place of communication, Hideyoshi placed his trusted general Masanori Fukushima (1561-1624) at Kawanoe castle, and Masanori reformed this castle into a modern one equipped stone walls. Kawanoe castle had been used for a while, but was finally abandoned in 1600 when Kawanoe area belonged to Matsuyama domain. Now the castle site becomes a park, and replica of the castle is built and used as a local museum. All buildings and most stone walls are imitations, but original stone walls slightly remain at the side and backward of central area. 15 minutes walk from JR Shikoku Yosansen line Kawanoe station. 20 minutes drive from Matsuyama Jidoshado Expressway Mishima-Kawanoe interchange.